Anything that can be done indoors we can do outdoors!!! Actually, we can do more activities outdoors because we can become big with our body movements and our artistic expression. 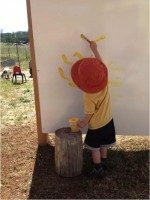 Children are able to paint on canvases that are bigger than themselves. Reaching for the top with their paintbrush, and stooping to the bottom, then up again, in a painter’s dance, children enjoy exercise and creativity at the same time. Bundle of Joy is nestled on six acres of open space, providing a natural environment, including farm animals. Each spring means new animal friends to observe and care for. Our little red wagon provides exciting rides. By taking turns riding and pulling, children learn that they can delight others as well as having fun themselves. 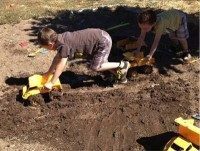 Children push our wheelbarrows and trucks following the wagon around the yard like a wagon train. We drive our dump trucks all over the huge open natural space. We have a big porch swing which fits all of us. We can read and sing while we swing, or we can get up and dance! Bundle of Joy promotes children playing safely in the rain. 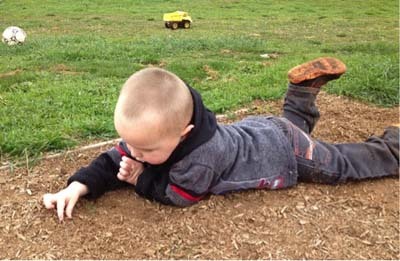 We encourage young hands to experience the joys of puddles and mud. We use water to drink, grow our garden, mix our dirt into mud, splash, sink and float at the water table, keep our sand castles together. I would like to acknowledge the Terri Lynne Lokoff Children’s Tylenol National Child Care Teacher Award who found my Bundle of Joy Community Garden Project to be an award-winning entry for 2014. Their award funded the required staff training for the Nature Explore certification. Thanks to Jamie Castaldo, from Rural Communities Child Care, through whose grant we received two child-sized wheelbarrows. We truly appreciate Cassandra and Ross Bartoe, who built our lovely planter boxes. My unceasing gratitude goes to Bundle of Joy’s greatest contributor to my dream of a Nature Explore Certified classroom, my husband, John Goulart. He retired to join my work as my assistant and staff cook. The children love him. John is the caretaker of our six acres, tirelessly mowing, repairing, and feeding animals. He builds all my wild ideas. 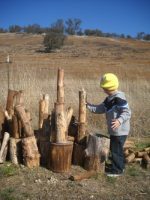 He constructed the stages I designed, fine-tuned my gathering arch, built my xylophone, and regularly tills the dirt/mud area. John and my son Shawn built the permanent garden fence. 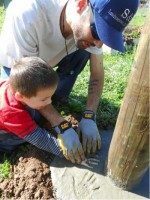 The children made hand imprints in the posts wet cement, and each print holds the child’s initials, forever a part of our program. My children, Steven, Patrick, Shawn, Jarrod, and Hannah, have been involved in my work since their childhood. Each acted as assistant, completed yard work and maintenance. They shared their mother with many children. My family has been the support of my dream for the whole child to experience high-quality education and care at Bundle of Joy Nature Preschool Childcare. 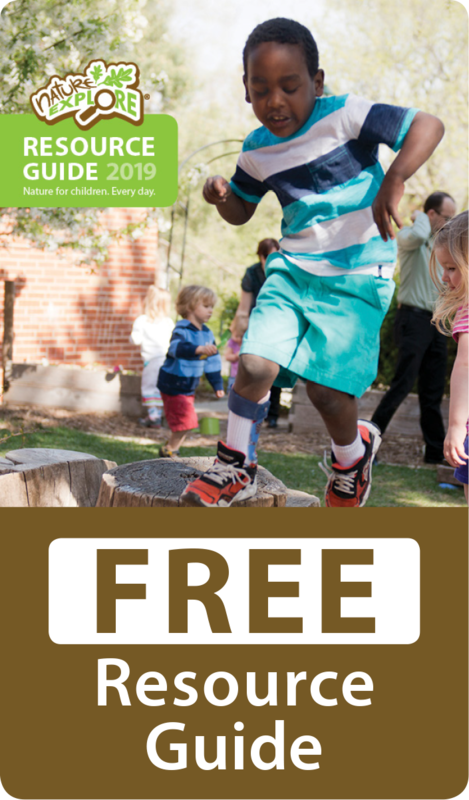 My hope for my future to is to connect with my community to raise awareness of the healing and learning potential our earth gives us when we play outside in a nature-based environment from early childhood and continues throughout our life.